The 1969 mission to the moon has been seen in many phases before but never with the shining, crystal-clear fullness of Todd Douglas Miller's extraordinary "Apollo 11," a documentary culled from archival footage and audio recordings that in heart-stopping, minute-by-minute detail, recaptures the propulsive force of man's most glorious feat, giving new resonance to those beautiful, headlong Mission Control words: "We Are Go." Timed to the upcoming 50th anniversary of the lunar landing, "Apollo 11" was compiled partly from a previously forgotten trove of 70mm film that includes footage from the launch, the Cape Canaveral crowds watching outside J.C. Penny's and along motel balconies, and the astronauts' recovery. It features no talking heads or narration, just audio from some 11,000 hours of NASA audio recordings and, occasionally, the sonorous gravity of Walter Cronkite's broadcasts. The clarity of the large-format and restored images is startling. So much of the imagery from the moon landing has by now flattened into iconography, but, here, the event is brought back to life. Miller starts on the cusp of launch as the enormous platform is moved by giant tracks toward the launch site. It could be a shot from "Star Wars" or any number of science fictions the moon mission birthed. Later we see Neil Armstrong, Buzz Aldrin and Michael Collins in their suits before putting on their helmets, and it's like we've never seen their faces — confident, with an almost mischievous glint — so well. "Apollo 11" might not tell you anything you don't already know about the moon landing. But it will make you feel it, and see it, anew. Miller has condensed the eight-day expedition into an immersive thrill ride, from launch to return, that puts you in in the shuttle with the astronauts and in Mission Control's ear. It's the grandeur of Apollo 11 distilled down to its still jaw-dropping essence. Much of the emphasis is on how the drive to the moon was so much broader than the two astronauts who carried out John F. Kennedy's 1962 pledge. Kennedy's words ("We choose to go the moon in this decade and do the other things not because they are easy, but because they are hard") hang over the movie with a kind of fervor and ambition that today sounds downright alien. Later, while the spacecraft is in mid-flight to the moon, news of Chappaquiddick and Ted Kennedy will play on NASA television sets while onlookers, drawn back to earth, momentarily gawk. But it's in the thousands who contributed to the mission that the magnitude of the effort comes through. Their faces are seen in montages and their voices are heard, again and again, on NASA radio: a multitude who at every significant turn confirms that their department is, indeed, "a go." We have, of course, been to the moon before at the movies. Most recently, there was Damien Chazelle's rigorous if overly brooding "First Man," which — despite its many fine attributes — looks all the more muted in comparison to "Apollo 11." 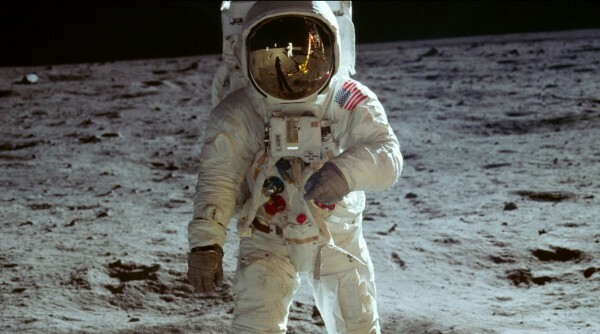 More notable was Al Reinert's brilliant and similarly verite-styled 1989 documentary "For All Mankind," which also used NASA archival footage and a good score (from Brian Eno) to recreate Apollo moon missions. But in 2019, as we are writing obituaries for the deceased Mars Rover ("It was 15"), "Apollo 11" feels even more like another time and another world. What was this splendid, sunny American dream and where did it go? "Apollo 11," a Neon and CNN Films release, is rated G by the Motion Picture Association of America. Running time: 93 minutes. Three and a half stars out of four.